For super entrepreneur Mark Cuban, it all started with a pair of basketball shoes—but not the ones you’re probably thinking of. This particular pair of footwear has nothing to do with the Dallas Mavericks, the NBA team he owns and passionately champions. Instead, it was this really cool pair the 12-year-old Mark thought he desperately needed. When he asked his father for them, the answer was a definitive no. Mark already had of perfectly fine pair of shoes. “When you have a job, you can get whatever you want,” his dad said. It was a lesson young Mark took to heart. If you want something, you have to work for it. And work he did. With the help of one of his dad’s friend, Mark began selling garbage bags door to door. He promptly fell in love with business. Since that long-ago venture, Mark’s never looked back. In 1990, he sold his first company, MicroSolutions, for $6 million. His next undertaking, Broadcast.com was sold to Yahoo for $5.7 billion. In 2000, this maverick acquired the Mavericks, which is currently listed as one of Forbes’ most valuable franchises in sports. Today, he continues to be heavily involved with the team, along with many other business opportunities and ABC’s Shark Tank. 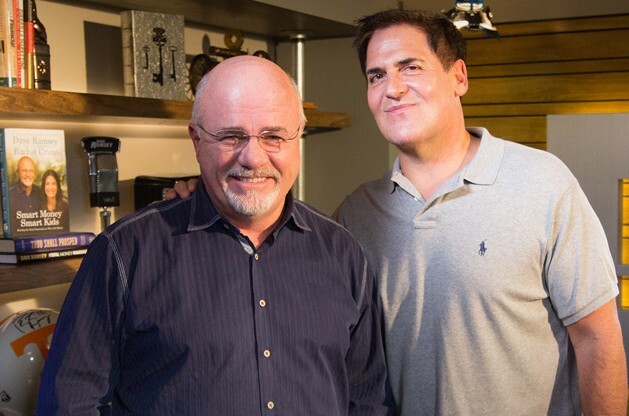 On a recent EntreLeadership Podcast, Dave spoke with Mark about his business smarts. Here are a few takeaways from their amazing conversation. 1. There’s no reason it can’t be you. After completing college, Mark moved to Dallas, Texas, where he tended bar, sold software, and did whatever it took to learn and get ahead—even down to eating mustard and ketchup sandwiches when times were really lean. But no matter how tough, though, he never gave up. When he felt down and the odds were against them, he just worked harder. 2. Selling ultimately comes down to connecting and serving. Through his hard work, Mark learned another valuable lesson. If you can sell, you can accomplish just about anything. And the key to selling is connecting with people while serving them. 3. Don’t be a slave to the bank. Like Dave, Mark is passionate about staying debt free, especially when it comes to beginning a business. In fact, he says, 99% of today’s companies can be started without capital. For Mark, life is pretty sweet. Besides his many successful companies, his beloved Mavericks and his gig on Shark Tank, he’s recently written a book on what it takes to become a thriving entrepreneur: How to Win at the Sport of Business. In it, he tries to spread his simple message of success that anyone can apply. It’s like Mark’s father always taught him. Hard work pays rewards. “There are no shortcuts,” he says.